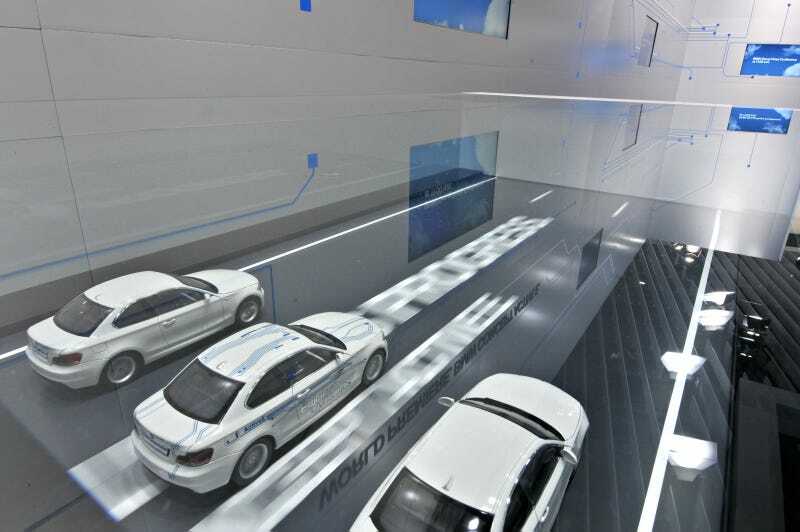 BMW's Detroit Auto Show stand has a small case with three 1-Series models in it. When you push a button, they drive down a moving "road" belt with no leads or brackets attached. How the heck does it work? Maybe we're missing the obvious, but we have no idea. For what it's worth, none of the assembled journalists — not the greatest demogaphic for technical matters, but still — seemed to have a clue either. Anyone know? There are no obvious wires, no guiding tracks in the belt (i.e., they're not slot cars), and nothing seems to connect the cars to the rest of the case. Magnets? Radio waves? Magic? It's drivin' us nuts.